Dr. Joshua Holden, Mathematics Professor at the Rose-Hulman Institute of Technology is a proponent of what he calls the “rule of four” in teaching mathematics. He believes that math concepts should be expressed not only in formulas, but in words, pictures and tables. 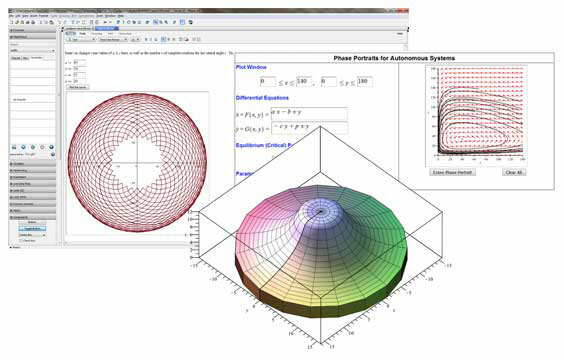 He considers Maple™, the technical computing software from Maplesoft, a powerful tool in his efforts to help students better visualize mathematics. About 2000 students use Maple as part of their curriculum at Rose-Hulman. The Institute’s laptop program ensures that each student has access to a laptop making it much easier for students to work with Maple whenever and wherever they happen to be. Dr. Holden especially appreciates that when he illustrates an example using Maple, students can create the same example and experiment with Maple on their laptops during his lectures. He says this saves time in the classroom, and also makes the students less dependent on the instructor. Dr. Holden also appreciates the Maple Cloud Document Exchange , which facilitates easy sharing of Maple documents. He believes it is the best means to share Maple documents with and between students, in an age where they are used to online networking and internet sharing. Apart from the benefits in teaching and learning, Dr. Holden says Maple helps prepare students for the real world. He says students come into the class with the notion of computers as toys, and their interaction with tools like Maple and the discovery of what they can and cannot do with such tools gives them a whole new perspective. They see the breadth and depth of the different resources that are available to them, and they start looking at sophisticated computer programs as tools that can empower them. “Technology is such an integral part of students and student life, and the use of tools like Maple is fundamental to a successful classroom experience,” concludes Dr. Holden.